HP Photosmart C6180 is an all-in-one printer designed to serve offices and small work groups. Along, with the basic features like, print, scan, and copy; the printer also offers wired and wireless networking, and fax functionality. It uses 6 HP Photosmart C6180 ink cartridges to produce high quality text prints and pictures. It is PictBridge compatible and allows direct printing from USB, memory cards and digital camera. This compact all-in-one printer weighs approximately 10.6 kgs and measures 24.7x45x38.5 cm. It boasts monochrome resolutions of up to 1200x1200dpi for text and 4800x1200dpi for colour prints. It supports an ADF on top of the scanner's lid. It features two paper trays with good storage capacity. Its input tray can hold up to 100 sheets and the output tray can hold up to 50 sheets. It has an easy to use control panel for accessing menus and other functions. Even after providing a good range of features, this colour inkjet printer compromises with speed. It is capable of producing only 15 ppm for monochrome prints and 11.5ppm for colour prints. This can be a big issue for busy working environments. 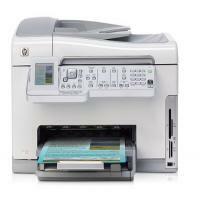 The HP Photosmart C6180 is a reliable all-in-one printer for office users. This compact device offers breakthrough performance and good quality prints with its quality its six ink cartridge system. Its high-end features like, ADF, wireless and wired connectivity, fax functionality make it an effective stand-alone device for offices users. However, if speed is an important factor, this printer might not be a best choice. Q. I’ve ordered HP Photosmart C6180 ink cartridges from your site. Is it necessary that I must be present at the given address, at the time of delivery? A. Your signature might be required at the time of delivery for the HP Photosmart ink cartridges. However, while making an order through our website you are authorizing us to accept signature from another person on your behalf if the order needs to be signed for and you are not present at the time of delivery. Q. I want to order HP Photosmart C6180 ink cartridges from your site. What payment methods do you accept? A. You can pay using Laser Card, American Express, MasterCard or Visa credit card, Maestro, Switch, Solo or Delta debit card. When you purchase an item on this website the payment will be hosted by Sage Payments to ensure maximum security of your credit/debit card details. Q. Does the printer supports wired and wireless connectivity technology? A. Yes, the printer supports both wired and wireless connectivity technology. Q. What is the printing and copying speed of HP Photosmart C6180 printer? A. The print speed of the printer is 32 pages per minute for B/W and 31 pages per minute for coloured documents. The copying speed of this printer is 32 ppm for B/W and 31 ppm for coloured documents. Q. Is the HP Photosmart C6180 ink cartridge compatible with other printer models? A. Yes, definitely. These ink cartridges are compatible with HP Photosmart 3108, HP Photosmart 3110, HP Photosmart 3310 and many more. You can find the list of compatible printer at this page of our site: https://printerinkcartridges.ie/hp363-multipack-18-3-free. Q. Do you offer any free cartridges in a multipack of HP Photosmart C6180 ink cartridges? A. Yes, we offer different number of free cartridges for different multipacks. We’ve already mentioned the number of free cartridges, with the multipack details. Q. What can be done if the ink in the indicated HP Photosmart C6180 ink cartridge is near to its expiration? A. Each of the ink cartridges has an expiration date. The purpose of the expiration date is to protect the printing system and to ensure the ink quality. When you find the message that the ink cartridges are expired, remove and replace the expired ink cartridges, and then close the message. You can also continue printing without replacing the ink cartridge, by following the instructions on the HP All-in-One or the ink cartridge expiration message on your computer screen. We recommend replacing the expired ink cartridges as soon as possible as the result obtained from the expired ink cartridges cannot be guaranteed. Device service or repairs required as a result of using expired ink will not be covered under any warranty. Q. Can I purchase only the cyan ink for my HP Photosmart C6180 printer? A. Yes, the printer employs all 6 HP Photosmart C6180 ink cartridges individually so you can buy cyan ink separately. Likewise, all the colours black, yellow, magenta, Light Cyan, and Light Magenta can be purchased independently from this site. Q. Do you provide multipacks of the cartridges? Will I get any discount on ordering for the multipacks from this site? A. Yes, we provide multipacks of 6, 12 and 18 cartridges containing 6 colours in it. You will also get additional cartridges for free on buying these multipacks like with 6 get 1 free, with 12 get 2 free and with 18 get 3 free. Buying a multipack is very economical and a big money saver. Since you print large amount on a daily basis we would recommend you to buy the multipack of 18 HP Photosmart C6180 ink cartridges which are available above on this site. Q. Do you sell power cord? A. No, are not selling the unit including the power cord.